EPWORTH — With an engaging smile, Sister Christin Tomy, OP — a “farming sister” who manages the gardens and works with beginning farmers for her southwestern Wisconsin community, the Sinsinawa Dominican Sisters — took her young audience on an imaginary road trip to point out the signs of God’s call in her life. “I want you to listen for the signs that helped me know, not at one time, but little by little, where God might be calling me,” she said. 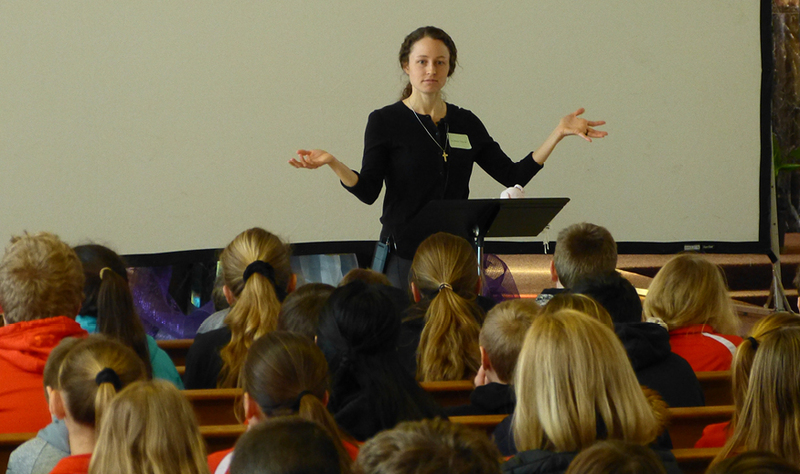 Approximately 250 students from area Catholic schools heard Sr. Christin in the main chapel of Divine Word College on Tuesday, March 12. 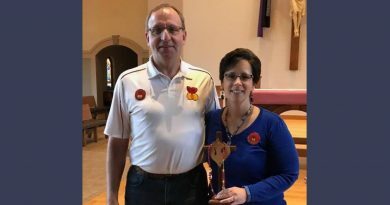 She was the keynote speaker for the annual sixth-grade vocation day, sponsored by the Dubuque Area Vocation Association (DAVA). Members of seven religious communities of men and women, a diocesan priest, a seminarian and a deacon met with the students to talk about religious life. 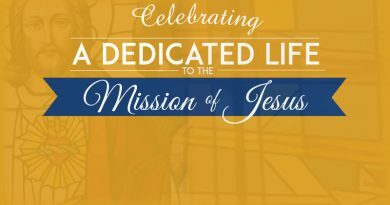 We all have a primary call to vocation, Sr. Christin said, that of love and service to God and our brothers and sisters — a call to holiness. Because everyone is different, there may be a secondary call to accomplish that in a particular way. Growing up in Cedar Rapids and attending Catholic schools, Sr. Christin did not know much about religious sisters and her perspective on the world was a bit limited. In eighth grade, she went on a service trip to Omaha where she visited a homeless shelter. Her understanding of the Gospel changed. She could see that, as God’s children, we are called to serve one another. In high school, she went on a mission trip to Honduras. While traveling in a beat-up pickup truck driven by a sister, some cows blocked the road and brought them to a stop. Suddenly, the sister turned to her and asked if she ever thought about becoming a sister. 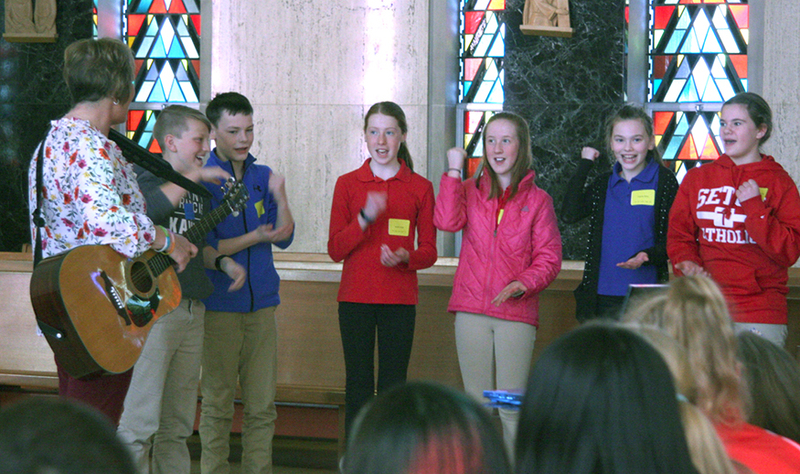 Students participated in a variety of activities (like the musical skit shown above) during the vocation day. Enrolling in the College of St. Benedict in Minnesota, she studied languages, fell in love, and continued her service and volunteer work. After graduation, she joined the Jesuit Volunteer Corps and spent two years in Belize before returning home. All along, thoughts of religious life kept popping up, and like a game of Whack-A-Mole, she kept pushing them down, until one day she decided. She would become a sister, but she was terrified of telling friends and family. To her surprise, her best friend and her parents said they could see her in religious life. Still a little fearful, one day sitting at Mass with a friend, she heard the song “The Summons,” and its lyrics struck a chord of commitment. 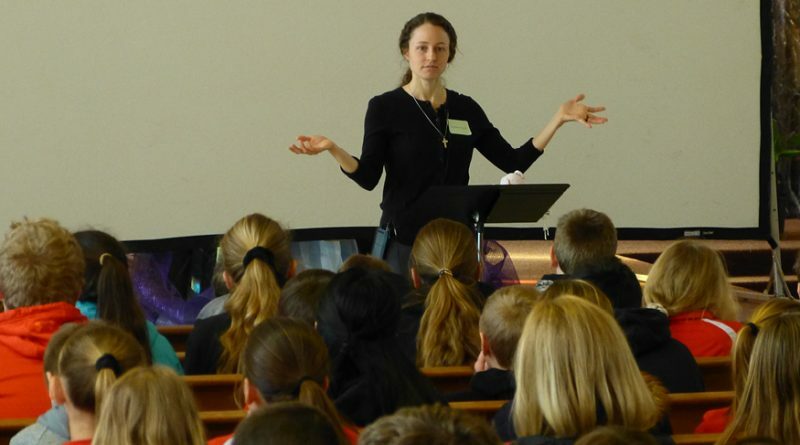 After her talk, the sixth-graders fanned out to hear more about religious life in a series of presentations on three floors of Divine Word College. But Sr. Christin’s message about God’s universal call to holiness and the subtle signs in each person’s life left an impression. 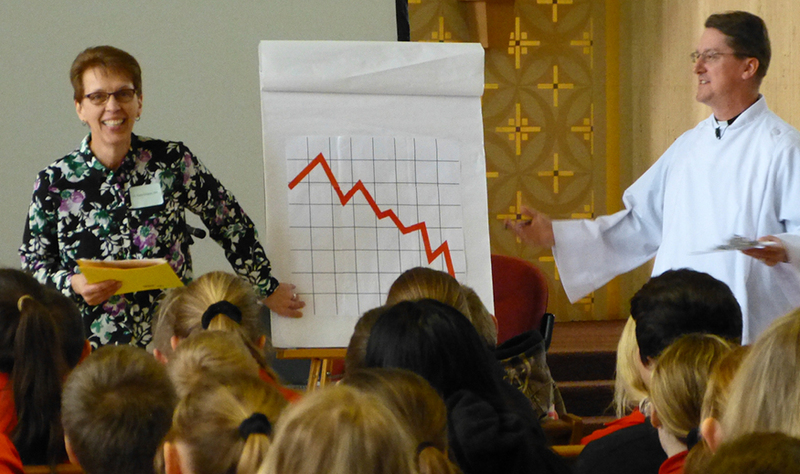 Sister Kathy Knipper, OSF, and Father Adam MacDonald, SVD, speak with sixth -graders during the vocation day, which is sponsored by the Dubuque Area Vocations Association. 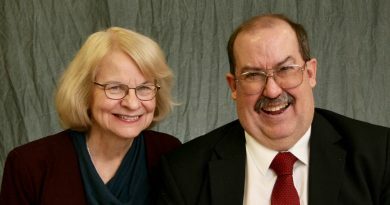 The Divine Word missionaries are part of the association. Kundert is pubic relations specialist for Divine Word College in Epworth.